Secured Document Destruction / Newspaper Recycling - ACHIEVE Human Services, Inc. 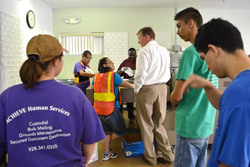 Thank you for your interest in ACHIEVE Human Services for your document destruction needs. The following is some basic information about our services. Please call (928) 341-0335 to request a detailed quote for secured document destruction services. We look forward to serving you! CONTAINERS:For your convenience, we have 64 gallon locking bins for you to store your documents until pick-up. There is no extra fee to use a container. Please call (928) 341-0335 to request a detailed quote for recycling services. We look forward to serving you! Or, you can call and schedule a pick-up when you need it. 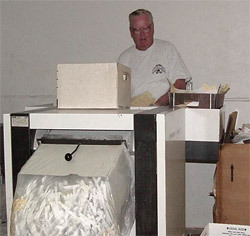 Once we receive the documents from you, we bring them back to our facility. Here we weigh it, and send an invoice to you. Along with the invoice, you will receive a Document Destruction Letter, or Certificate of Destruction.